Located close to the town of Sawai Madhopur (11 km), the Ranthambore National Park remains skirted by the ranges of the Aravalli and Vindhya mountains. The terrain of the park comprises desert and semi-desert vegetation. The national park has a core area of 392 km and lies close to the outer fringes of the Thar Desert. 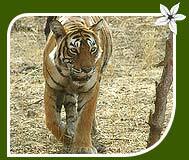 It gained the status of being a national park in the year 1980 and was included under the Project Tiger Scheme in 1973. 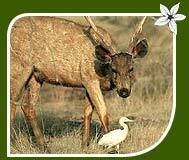 The Kaila Devi Sanctuary and the Man Singh Sanctyary also happen to be a part of the Ranthambore National Park. Thousands of visits each year! Its not only due to the much photographed Ranthambore-tigers that wild fanciers have the national park heading their visit list. The park harbours a variety of mammals, 264 species of exotic birds and a number of reptiles. Tigers, the major draw for visitors, can easily be spotted here. For tiger sightings, you need to get to the three lakes  Padam Talab, Raj Bagh Talab and Milak Talab. Those who fancy seeing panthers in their natural habitat can head straight to the Kachida Valley, an ideal spot to watch these spotted felines. Other mammalian species that you can enjoy watching here include sambhar, sloth bear, chinkara, chital, nilgai, leopards, jungle cats, fox, gazelle, antelopes and hyena among others. Bird watchers too would love making a trip to the national park. There are avian species like painted storks, black storks, Indian horned owl, quail, partridge, peafowl, spur fowl, paradise flycatcher, Bonellis eagle etc. Monitor lizards and marsh crocodiles are special attraction for reptile lovers. What else to see and do? 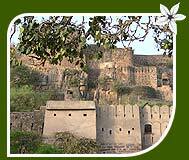 Dont miss to visit the Ranthambore Fort that, after which the national park is named. Belonging to the 10th century, the fort is one of the most ancient in the state of Rajasthan. Also visit the Jogi Mahal, a forest resthouse. Here, you can witness the second-largest banyan tree in India. Visit the town of Sawai Madhopur which has the Project Tiger office. Guides are also available here. The closest airport from the national park is Jaipur, 145 km away. The airport has frequent flights to the key destinations of the country. Sawa Madhopur, which is 11 km away, is a convenient railway station, located on the Delhi-Mumbai railway track. By road routes as well, Sawai Madhopur is well connected with all the important cities and towns of the state. Adventure lovers can easily book their accommodation at luxurious tented resorts and jungle lodges. A few of these are as follows.